Welcome to the last week of November, this season is flying by. With only three more shares to go after this week it’s time to start thinking about our 14 week Spring Season, March- June 2019. Sign up before December 22nd and receive a complementary jar of our delicious, low-sugar strawberry jam. Visit our Online Store for specific pricing, dates and to sign up. 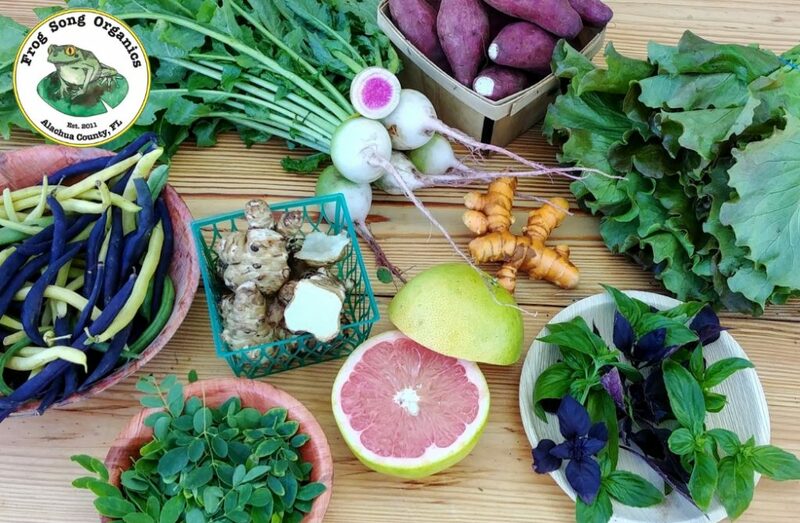 This week your share includes: Fingerling Murasaki Sweet Potatoes, Turmeric, Purple and Green Basil (whoops, just kidding), Juicy Ruby Red Grapefruit, Red Leaf or Baby Romaine Lettuce, Sunchokes, Moringa Leaves, Tri-Colored Beans and NEW THIS WEEK…the vibrant Watermelon Radish. Sorry folks looks like the basil was ready to be done a little sooner than we expected. We salvaged what we could before the freezing weather arrived, however, this morning when I went to pack my CSA shares I opened the box of basil to portion it out in cute little bags and the green basil had already started to become discolored and wilted. We definitely don’t want to stand behind produce that is not up to our standards so at the last minute we decided it’s best use would be for making our last batch of pesto. I am very sorry and I know you will likely be as disappointed as I was this morning. It’s a true end to fall when the basil is done. We should just be thankful it lasted for this long! Not to worry I subbed in some baby cucumbers for half of the shares and some summer squash for the other half. Watermelon Radish- First of the season, this light green and white radish contains a bright pink starburst of color on the inside, hence the resemblance of its namesake the Watermelon. Enjoy this radish on crudite plates, on top of toast, or in salads.When you get home from picking up your share make sure to cut the greens from the roots, the greens pull out the moisture of the radish. Once separated from the green the radish can stay in your refrigerator for a few weeks and will brighten any dish with just a slice here and there from time to time. I love this radish! Murasaki Sweet Potatoes- These small bite sized sweet potatoes are small but dont be fooled by their size they are our most prized sweet potato. Thin crimson skin with a white flesh, simply wash and bake, don’t waste your time peeling. Preheat oven to 425 degrees. Heat a large baking sheet or skillet in the oven 15 minutes. Combine salt, cinnamon or nutmeg, and any other seasonings you would like in a small bowl . Toss potatoes in a medium bowl with the olive oil. Sprinkle generously with seasoned-salt mixture, and arrange potatoes in a single layer on preheated pan. Roast until they are tender when pierced with a sharp knife, 20-25 minutes. Remove from oven, and serve hot. Red Leaf Lettuce from our friends at Siembra Farms in Gainesville. Here is a great example of two farms working together to feed the system of supply and demand. Siembra was looking to move their lettuce before the first frost and unfortunately our lettuce did not come in as expected due to the rains that washed our seeds out of their beds countless times. We reached out to Cody at Siembra and he was happy to supply our CSA Members and Farmers Markets with some beautiful red leaf lettuce. Thanks Siembra! Ruby Red Grapefruit/Meyers Lemon- Ruby Red Grapefruits from our trees and Meyer Lemons from Melrose Organics- for the Thursday shares who missed out on the lemons from last week due to the Thanksgiving holiday. Meyer lemons were first introduced to the United States from China in the early 20th century by Frank Meyer.This sweet winter citrus is a cross between a regular lemon and a mandarin orange and that’s what really sets it apart. These lemons don’t have the same tang as regular lemons, instead, they add more sweetness to any recipe. Sunchoke- Nutrient-rich roots of a North American sunflower variety, with a sweet, earthy flavor. They store well in the fridge for a couple weeks after purchase. It’s up to you whether you peel them or not, but you can just give them a vigorous scrub and leave the skins on for maximum nutritional benefit. Rich in vitamin C, potassium and iron, sunchokes are crunchy and nutty when raw, with a texture similar to water chestnuts. When roasted, baked, or cooked into soups, they make a great substitute for potatoes. Try this crunchy root pureed into a soup or sliced thin to make Sunchoke chips. Turmeric- Turmeric is restorative and preventative and has far reaching health benefits for everyone and many people use it in their daily regimen to treat a variety of symptoms and illnesses. It is effective in treating heart disease, cancer, arthritis, inflammation and depression just to name a few. There is so much information out there on Turmeric that I would literally be writing for an entire week to try and explain all the health benefits of this wonderful superfood. If you are interested in learning more look it up on the world wide web or check out our past blog. When combined, these ingredients make a powerful daily tonic effective in fighting a host of ailments. In a cup, scoop a teaspoon of raw honey. Squeeze a teaspoon (feel free to approximate) of fresh lemon juice over the honey and mix. The honey will dissolve into the lemon juice. Once this happens, add your turmeric and your cayenne pepper. 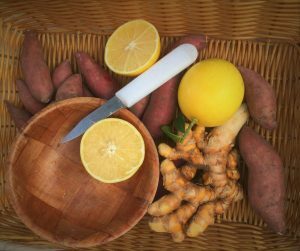 Mix thoroughly (you can strain if the textures will bother you) and enjoy lemon turmeric tonic. Moringa- This tree is native to North India but grows well in Asia, Africa and South America. It goes by a variety of names, such as drumstick tree, horseradish tree or ben oil tree. We started experimenting with Moringa as a multi purpose crop. Initially we started growing it as a foragable protein source for our animals, however, they did not seem to like it as much as our human customers did. It was also a nitrogen fixing crop (helping increase nitrogen content in our soils) as well as providing shade cover for the Turmeric. 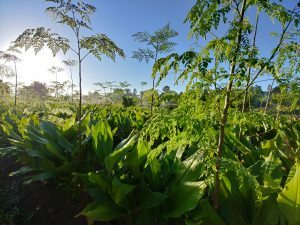 Most of all we found that fresh Moringa was actually very marketable and highly respected as a medicinal plant having similar “superpowers” to Turmeric and people love the natural, healthy energy it gives you. 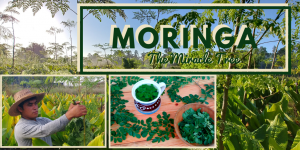 Dried Moringa is most commonly found in drugstores and sold online in powder form as a supplement that people can add to their smoothies however we have the unique opportunity to sell it fresh and teach people how to use it in their cooking or to make tea with it. Make some Moringa tea with the fresh leaves by boiling a ½ cup of fresh leaves in 1 ½ cups of water, let cool and enjoy with lemon, honey or ginger for added flavor. The Moringa leaves themselves are very light in flavor so you can add the tea to a variety of other drinks and get the added health benefits without compromising the taste of your beverage. Try it in your morning coffee or earl grey tea. I put about 3 teaspoons of the fresh (or dried) leaves in my coffee filter along with the coffee grounds. Amy made a batch of honey sweetened Hibiscus tea combined with a bunch of our Tulsi basil and some Moringa leaves for a super tasty elixir that will give you sustained amount of “awakeness” and energy without the jitters or caffeine hangover! If you have some frozen roselle give it a shot you will be hooked on the Moringa and the way it makes you feel!